Truth Wins Out executive director Wayne Besen appeared on CNN Headline News today to defend a British TV ad which featured gay men in parental roles, serving Heinz mayonnaise. Besen criticized U.S. foodmaker H.J. Heinz for succumbing to homophobia and withdrawing the ad under pressure from the right-wing American Family Association. About 200 viewer complaints were received by British regulators. 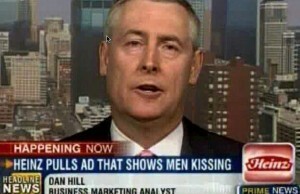 The Headline News segment included Randy Sharp of the AFA, who claimed that the ad promoted a homosexual lifestyle: “What does mayonnaise have to do with homosexuals and their lifestyle?” Sharp claimed that 70,000 AFA supporters in the United States disagreed with the ad. Besen responded that gay couples are well-accepted in the United Kingdom and that gay soldiers have been allowed to serve in British armed forces with great success.